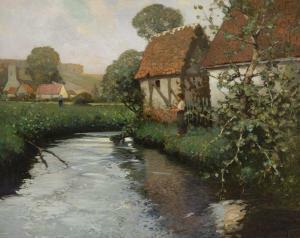 Find artworks, auction results, sale prices and pictures of George Ames Aldrich at auctions worldwide. 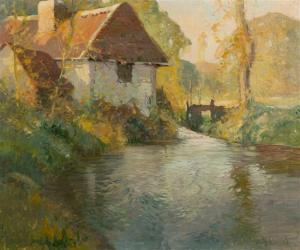 * George Ames Alrich (American, 1872-1941) House in Landscape oil on canvas signed G. Ames Alrich (lower right) 24 1/4 x 29 1/2 inches. Property from the Estate of June Kaiser, Chicago, Illinois Minor surface dirt; minor craquelure to upper edge of canvas; under UV no visible issues. Framed: 32 3/4 x 37 3/4 inches. WINDMILL BY GEORGE AMES ALDRICH (AMERICAN, 1872-1941). 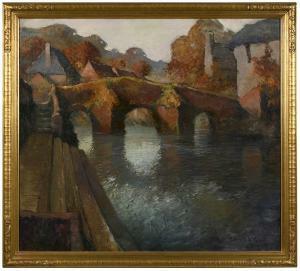 Oil on canvas, signed lower right. 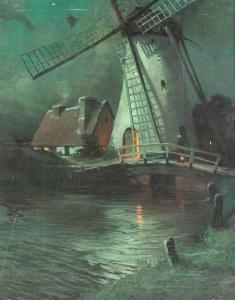 Night time windmill scene. Light surface wear. 30"h. 24.25"w., framed, 34"h. 28.25"w. Surface wear, small areas of paint loss, 1/4" tear. 1/9 We provide condition information when it is requested by a potential bidder, as a part of our dedication to excellent customer service. However, the absence of a condition statement does not imply that the lot is in perfect condition or completely free from wear and tear, imperfections, repairs, restorations or the effects of aging. Garth\’s Auctions shall have no responsibility for any error or omission regarding an item's condition. We encourage you to call or email with any questions. We also encourage you to come see us and preview the auction in-person. Thank you for your business. 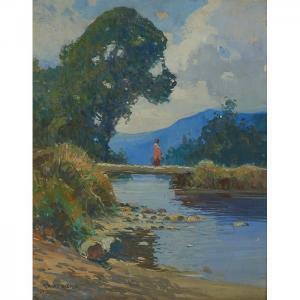 Description: George Ames Aldrich, (American, 1872-1941), Woman Crossing a Bridge, oil on canvas board, signed lower left, 20" x 15.75" Condition Report: Surface dirt. Localized areas of paint loss, most prominent in the sky. Scuffs to the surface, most prominent in the lower right quadrant. Small speck of a label visible underneath the signature in the lower left.